Hey Cornerstone Kids! 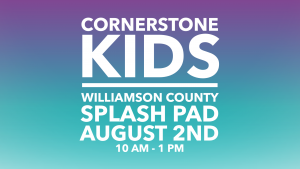 Come on out to The Quarry Splash Pad at Williamson County Regional Park. Thursday, August 2nd from 10 am to 1 pm. Bring a sack lunch, drink, towel, and sunscreen.